Corned beef gets its unique flavour and texture by first soaking in a salt bath and then being gently poached. It’s terribly old fashioned, but this is a very good version. 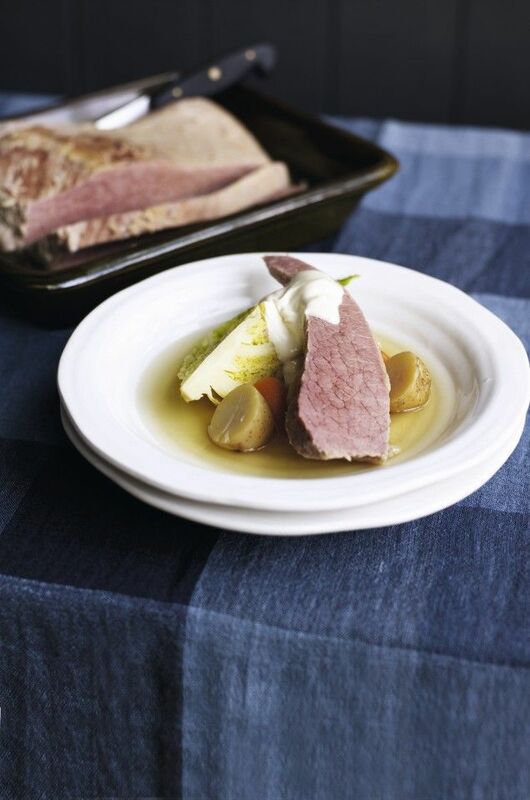 Soak the corned beef in a very large saucepan of cold water for 3–4 hours (or up to 12 hours). Drain, return the beef to the saucepan and cover with plenty of fresh cold water. Add the onion, carrot, bay leaves, celery, parsley stalks, peppercorns and star anise, if using. Bring to the boil, then reduce the heat, cover and simmer very gently for 2 1/2 hours. Check every now and then and skim the fat from the surface. Remove the vegetables with a slotted spoon and discard. Leave the beef in the poaching liquid and chill until needed. 3 To serve, strain the poaching liquid into a large saucepan or deep saute pan and bring to the boil. Add the carrots, potatoes and cabbage and simmer for 15 minutes, or until the vegetables are just tender. Slice the beef into 1 cm thick pieces and add to the liquid. Simmer until heated through. 4 Transfer the beef to large pasta bowls and surround with the vegetables. Ladle on a little hot poaching liquid and sprinkle with chopped parsley. Serve with a dollop of mustard-flavoured mayonnaise. To make mustard mayonnaise, stir 1–2 teaspoons Dijon mustard and 1 teaspoon lemon juice into 250 ml homemade or good-quality bought mayonnaise. Taste and add extra mustard to suit your taste. Corned beef is easily reheated. Save some poaching liquid and simmer the beef in the liquid until warmed through. Cook any fresh vegetables in a separate pan of boiling salted water.